Attention sheet metal fabricators. Need to protect your metal stock as it is being fed into a shear, or while sliding on an abrasive metal surface? 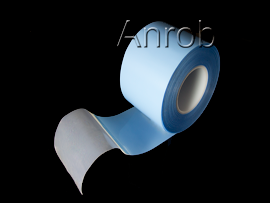 Shear Guard tape prevents marking and scratching of expensive sheet metal stock while it is being fed into or slid over a shear and any abrasive metal surface. Shear Guard tape is made of a self lubricating material, which provides one of the slipperiest surfaces available. Shear Guard is a pressure sensitive tape supplied on a peel away release liner. Simply peel off the liner and apply to the bed and rails of your shear(s) or on any equipment that tends to scratch your stock.